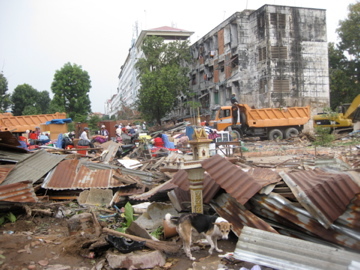 In January 2009, in the heart of Phnom Penh, the residents of the Dey Krahorm community were rudely awakened by bulldozers which were there to demolish their homes (albeit slum homes). Their land had been sold to a development company. 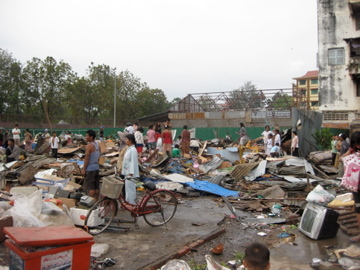 They could only collect a few of their belongings, before they were transported out of the city to a relocation site 22km west of Phnom Penh. Approximately nine months later, in the middle of the night, they were again violently evicted. This time they were sent to an empty field 38 km north of Phnom Penh, in a city called Oudong. This is where the Tang Khiev community was established. 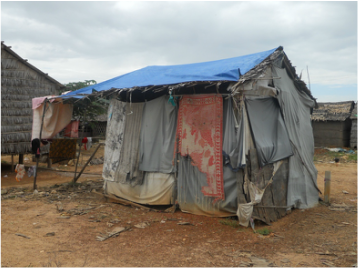 Tang Khiev stands for ‘Blue Tent’ as the field had no housing and the villagers were forced to live under blue tarpaulins. Along with no housing they had no, or very limited access to, food clean water, medical facilities, schooling or work opportunities. Subsequently, nearly all of the people live in extreme poverty, 85% are illiterate and the median household income is $13/week. 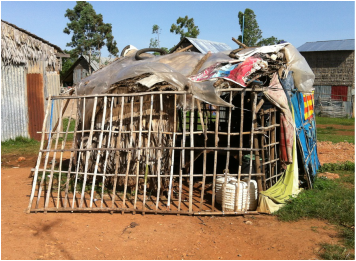 Despite these hardships, the families have slowly been re-building their lives with assistance from Manna4Life. Manna4Life's initial interaction with the Tang Khiev community, in 2011, involved organising a visionary meeting to look at the assets and resources within the community (both human and physical resources). Following this, the needs of the community were discussed. Four major goals were identified, including Basic Needs (clean water, food and sanitation), Housing (including land security), Employment and Education. Recognising the desire of the community to drive change from within, Manna4Life assisted the community early on to identify and form a Local Leadership Committee. This Committee consists of five women and five men (Tang Khiev locals) who consult with the community to make decisions about the community’s future, its needs and its goals. Accordingly, the community feels empowered and in control over their own future, and are highly motivated to achieve their goals. The benefits of this approach can clearly be seen in the community’s achievements to date on their four initial goals. As their initial goals are achieved, the Tang Khiev Community will continue to identify additional projects that will help them to achieve a sustainable future.